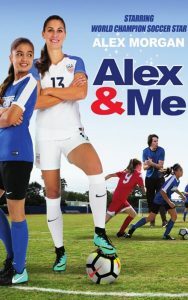 I recently had the chance to screen a new movie from Warner Bros. Home Entertainment called Alex & Me, which stars, soccer player, Alex Morgan. Now, I wasn’t sure what I was in for, but the movie sounded like it would be fun. Turns out, it was and it’s something the whole family can sit down and watch. Yeah, it’s a teen movie, but it’s also about family and taking time for each other. So, all across the board Alex & Me has a bunch of solid messages that we sometimes forget about when life gets busy. Alex & Me is a family movie with a seventy-six-minute runtime. It was written and directed by Eric Champnella. Here’s what the movie is all about. Reagen wants to play soccer, like her hero, Alex Morgan. After Reagen doesn’t make the soccer team she decides to give up on her dream. Discouraged, Reagen starts taking down her soccer posters when she falls and hits her head. As she opens her eyes… there stands, soccer superstar, Alex Morgan! Thing is, only Reagen can see Alex. After a long talk with Alex, Reagen decides not to give up on her dream of playing soccer and even better, Alex is going to help her train. As far as the story goes, I thought it was really good and, aside from the imaginary friend thing, it felt real. It’s easy to get discouraged and I thought Alex & Me did a really good job covering that while delivering their message of don’t give up. It also manages to cover the importance of family looking out for one another and the troubles of being the youngest in the family. The story was well written and I liked that nothing felt forced or preachy as they put out the messages. The playthrough was good and the pace keeps everything moving, so I never got bored watching it. The story does a good job at getting the audience to connect with Reagen and before you know it, even rooting for her. Now, I’m (way) older than the target audience and still enjoyed it, I’m sure the actual target audience will enjoy it even more. Since Reagen is the only one that can see Alex, there’s plenty of humor based on that. Like as she talks to Alex the camera pans back and watch as she’s talking to herself. Some of the cast is Siena Agudong (Star Falls), Alex Morgan (Alex & Me), Matt Cornett (Life in Pieces), Jim Klock (The Whole Truth), Chuti Tiu (Nashville), Colin Critchley (Rockaway), James Moses Black (Blacklist), Jessica Treska (Sharp Objects) and Andrew Rush (Drop Dead Diva). Overall, I thought the cast did well. Now, I haven’t see Agudong before this one so I don’t have a lot to go on, but she seems to have a lot of talent. She brought a real feel to the Reagen character and did a good job bringing the laughs to the scenes. The only problem I had with Alex & Me was the camera work. Sometimes it was kind of shaky and other times smooth. Other than that, I really dug the movie. Side note, Alex and Me will be available on Digital June 12, 2018, and on Blu-ray and DVD June 19, 2018. Summary : I think Alex & Me would make for a good family movie night. Alex & Me is rated G.